For the last three years I've been heavily involved with some of the finest drumming groups in the UK, regularly wreaking rhythmic havoc with The Edinburgh Samba School, blazing a tartan trail with Maracatu Escocia and swapping Auld Reekie for The Big Smoke to guest star with London's very own Maracatu Estrela Do Norte and Eri Okan. 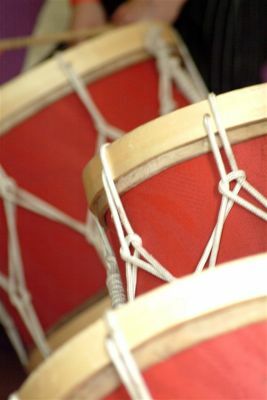 As well as bringing the rhythms of Brazil to events like the Edinburgh Festival and the Notting Hill Carnival. I've also regularly performed for the discerning feet of punters at high profile clubs including Departure Lounge and Karnival in Edinburgh, the groundbreaking Bebado in Glasgow and for good measure have welcomed in the summer with the No Point Crew at the one and only Beltane Fire Festival. 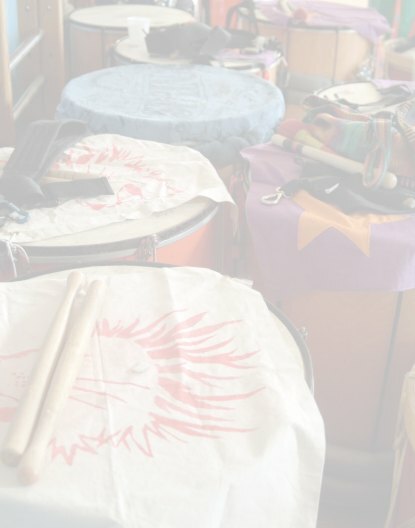 Based in Edinburgh I've lead workshops for the Samba School's beginners course, as well as for private companies and community groups. The last year has seen me honing my workshop leading skills through the Youth Music Initiative project in Edinburgh's primary schools, helping guide groups of kids through their very own Big Drum Adventure over a term of workshops to amaze their friends, family and teachers with some knockout performances that have to be seen to be believed, including (in November 2006) opening the annual Fanfare Concert at Edinburgh's Usher Hall!